This document describes Sound and Vision’s collection policy. It covers the most important issues regarding collecting, selecting, cataloguing, preserving and providing access to AV material. It also provides the context within which Sound and Vision operates and gives a global overview of the collection’s content. Lauwers, M (Ed.). (2015). 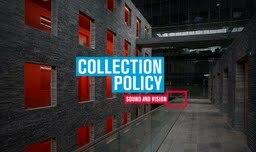 Collection policy Sound and Vision. (M Lauwers, Ed.). Netherlands Institute for Sound and Vision.